There are three types of pagers: numeric, alphanumeric, and two-way pagers. Numeric pagers display numbers only. They can indicate a number to call or a code that represents a pre-planned message (for example, “11” could be used to let you know you have a voice message or “22” could be used to let you know to call the office). Alphanumeric pagers allow you to use numbers or display short written messages, which can save you time by sparing you from making a call. A related type of pager is a voice pager, which displays a phone number and plays a short voice message. Two-way pagers not only can display a message, but also allows the recipient to send back a reply, which can save even more time. Two-way paging is usually offered only in large metropolitan areas. The standard method of alert is to play a series of beeps; however, many models can be set to silently vibrate when a message arrives. Many pagers have expanded memory which allows you to store anywhere from 10 to 30 messages in the pager for future reference. 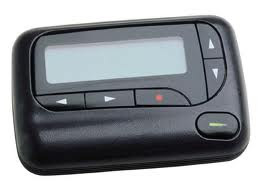 Many pagers also have a time a date stamp that tells you exactly when a message arrived. This can be very useful if calls will not be returned until later. Voice mail is also offered with some paging plans. This types of pagers give callers the option of sending a page or leaving a voice mail message. Some pagers will update users with stock quotes, news updates, sports scores, weather, and traffic information. Every paging service has varying levels of coverage. Depending on where you expect to receive pages from, there are services that offer local, regional, or national coverage. The larger the coverage area, the more expensive your paging service and/or pager will be. The paging market mirrors the cell phone market. The equipment has become more of a commodity over time. Service is becoming the differentiating factor. Many dealers waive the pager activation fee or sell the units at a loss to attract new customers. Monthly service plans can range from $10 to $40 per month depending on the plan. Fees will also vary depending on whether you currently own a pager.